There’s a certain twisted genius to the Hythe Ferry. Instead of a ticket counter at the Southampton terminal there’s an ancient machine. This requires you to (a) work out how much you think the fare is going to be, then (b) insert the exact right money for a tiny till roll style receipt that gets you on the boat. Fair enough, except the ‘exact money’ caveat requires the ferry firm to hire two full-time staff who sit at a desk a few yards away solely to (c) give you the change you need. Just a minute, why not get rid of the machine and get those dudes to sell the tickets? We’ve forgotten about this weird arrangement by the time a super cute pier railway deposits us in a beer garden on the other side of the water. It’s still a 25-minute hike to the venue and we arrive right on first whistle. This event feels more like a warehouse party than a sports event. Not because it’s so busy – although there is an impressive crowd for this, SCR’s first home open door – but because the PA is set to an ear-bleeding volume. Particularly if you arrive as late as we did and the only seats left are right by the speakers on Turn 3. The music level is proving a problem for those on track too, with players unable to hear calls from the referees or benches. The intervention of an NSO after four very confused jams results in a more conducive volume. It’s 19-8 to Brighton at this stage and that gap is just going to increase as the noticeably more bout-fit Rockerbillies tire out their Hampshire opponents. The likes of Hippy Hippy Skate, Polly Dartin’ and Van Hayley provide tough blocking for the Sussex side, with Lab Wrath and Obliviator amongst those chalking up big hauls in the Brighton star. White Lightning puts in some great blocking shifts for SCR, but the ‘billies go into half-time 119-66 up. A mammoth 35-0 eight pass jam from Irish Mist early in the second period sets the tone for how the game will play out. The impressive Speedy Gonzalex, one of the newest skaters in Brighton’s ranks, adds a 25-0 jam of her own (after Southampton take lead jammer status, no less) and the home support are pretty subdued now, with almost all the noise coming from the small Sussex contingent. The hosts go several jams without scoring before Ja Cruel puts five on the board. Foul outs are coming thick and fast for SCR now. The Brighton bench crew of Gin Atomic and Swann – suitably bedecked for this Ru Paul’s Drag Race themed event – call a time out to force one final jam and the Rockerbillies roll out 365-106 victors. Unfortunately, BRATS can’t make it out to sunny Reykjavik for this one, largely as it’s on the same weekend as the Iceland Airwaves music festival. Having attended this a few years ago, we know what it does to the price of flights/hotels (triples them, basically) so the trip is sadly too spendy for the current state of our wallets. Indeed, only nine Rockerbillies are able to make the journey out there. At 2,000 kilometres each way it’s more than three times further than any Brighton team has previously travelled for a game! Those that do make it out there, together with a bench duo of Rose Bleed and Racey, put up a good showing against what is essentially the Iceland national team. (Officially called Ragnarök, this is the only derby side in the entire country.) Things are pretty close for much of the game, but the difference in squad size see the hosts impose themselves on the tiring ‘billies late on. Iceland takes the win 171-129. Unfortunately, the game also sees Chloe Colossus re-dislocate the shoulder that popped out at Eastbourne Extreme. Get mended soon Chloe! On to this Saturday’s action then, and it’s true to say that this is going to be a really tough challenge for the Brighton B-team. A few Rockers folk were unsure as to whether it’s the A- or B-team Roller Derby Lille are sending over, but the French league have confirmed to BRATS that it will be their first team, the super strong Switchblade Roller Grrrls. 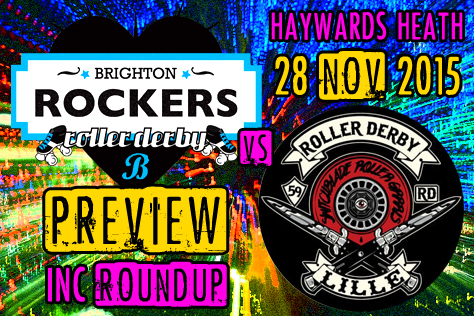 A mixed level Brighton side went down 171-136 to Switchblade in France last summer and a similar result will be good going for the Rockerbillies. Flattrackstats.com ranks the visitors 108th in Europe on 535.3 points. The Brighton B-team are finally ranked themselves (as a result of the game in Iceland) and place 312th on 446.2. The prediction computer at FTS reckons the Lille side have 94% chance of taking the win. An expected score differential of 59:27 would equate to something like a 236-108 away win. In the face of such imposing odds, the Rockerbillies could do with as many fans as possible cheering them on this Saturday. The venue is the Dolphin leisure centre in Haywards Heath. Tickets priced at £10 adults, £8 students and free for Under 12s are available on the door, or you can buy online (up until 4pm Friday) to take advantage of a 4-for-3 offer. Doors are at 2pm, with the A-team facing Gent GO-GO first at 2.35pm, before the ‘billies take on Switchblade at around 4.40. You can find more details plus a preview of the A-team match HERE. Don’t forget to pick up your copy of our new look (very orangey) fanzine on the door – this issue includes a big interview with Rockerbillies captain Irish Mist about the B-team’s adventures in 2015. Cheers! This entry was tagged Brighton Rockerbillies, Brighton Rockers, Haywards Heath, roller derby, Roller Derby Iceland, Roller Derby Lille, roller skating, Southampton City Rollers, sport, women's sport.